Default product mode - There are four modes in Product designer - T-shirt, Sticker, Engraving and Fixed objects. You can choose one mode which will be shown by default. Product side width (px) / Product side height (px) - default values for the product side (front, back, etc.) area. These default values will be assigned after the creation of a new product. You can change these values in the Product designer settings for every product. Unit of length - Product designer has many options related to sizes. You can choose the unit which is more comfortable for you (millimeters or inches). Ratio ("Unit of length" per pixel) - amount of pixels in the unit of lenght. You need to specify how many millimeters or inches will be contained in one pixel. Remember, that on the screen you see an image which is measured in pixels but your real product is measured in millimetres or inches. You need to specify a ratio to correlate a product dimensions which you see on the screen with demensions of the real product where you will print a custom design. Please read here how to calculate the Ratio. Allow upload images for customers - if you turn this setting off, customers will not be able to upload images. Flash object width (px) - after enabling Product designer tool for a certain product, customers will see an area which contains settings for manipulations. The "Flash object width" setting sets width of this area. Layout orientation - here you can choose Product designer tools panel location as it will be shown in the storefront. per line of text - you can set a price for a text line. per a square centimeter of text - it may be a good option for the text of a very big size. Text price - enter a price for the text item chosen above. 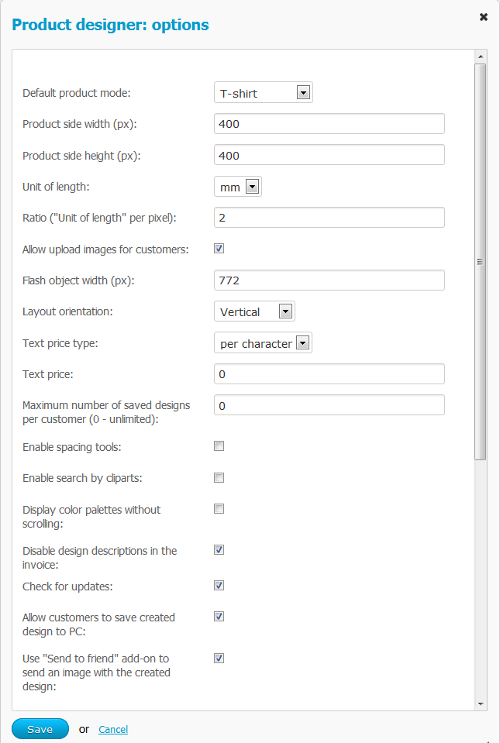 Maximum number of saved designs per customer (0 - unlimited) - enter a figure indicating the number of allowed designs to be saved in the storefront by one customer. Display color palettes without scrolling - tick this checkbox to display color palettes without scrolling on the Product designer tools panel. Don't tick this checkbox and scrolling will appear when lots of different colors are created. Disable design description in the invoice - tick this checkbox and design description will not be shown in the invoice. Check for updates - if this checkbox is checked, administrator will get notifications about new versions of Product designer. The notification will be displayed in the admin panel on edditing product page -> "Product designer" tab. Allow customers to save created designs to PC - tick this checkbox and customers will be able to save created designs to their computer. Use "Send to friend" add-on to send an image with the created design - tick this checkbox and customers will be able to use "Send to friend" function to send a link to the created design and an image showing the created design.